It is fantastic to see tfl promoting bus transportation in this way. They’re encouraging people to see travelling by bus in a totally different light and encouraging people to think about trying the bus out. It is for many a cheap and convenient form of transport, and many members of the public might not even think about trying it out. By running such events and promotions, tfl can encourage greater bus use and take even more cars off London’s busy streets. Of course, London’s bus network is very different to those outside of the M25. Tfl keeps its routes under very close control, but also invests heavily in them. This means that London’s routes run at very high frequencies using very modern buses, often electric hybrids, as mandated by the tfl contract. It is therefore easier to encourage people onto the buses of London when such a network is in place which means it’s hardly unsurprising that similar campaigns aren’t prevalent in provincial Britain. One such place where a bus-encouragement campaign is in place, however, is York. “There’s never been a better time to get the bus,” proclaim posters on advertising hoardings across the city. It’s the sort of message that local authorities really should be promoting. The more people that use bus services, the need lessens for public subsidy. Furthermore, bus travel removes cars from congested city centre streets, making the centres more attractive places to be. In a city as reliant on tourism on York, having local residents taking the bus into town frees up car parking spaces for cash spending visitors. 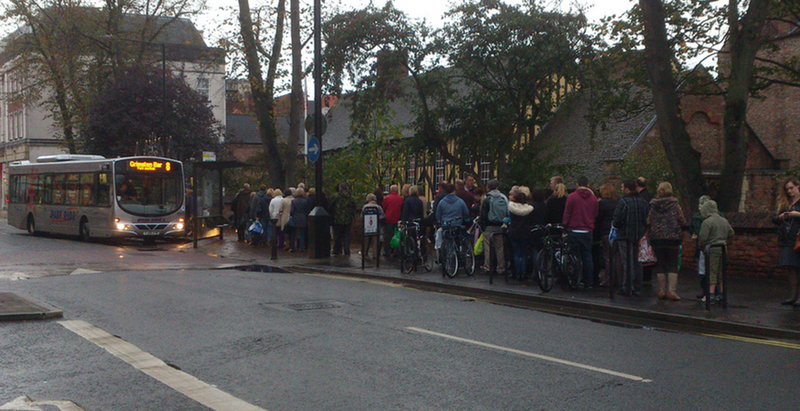 Time and time again, York City Council have shown themselves to be a Council that really promotes bus travel. 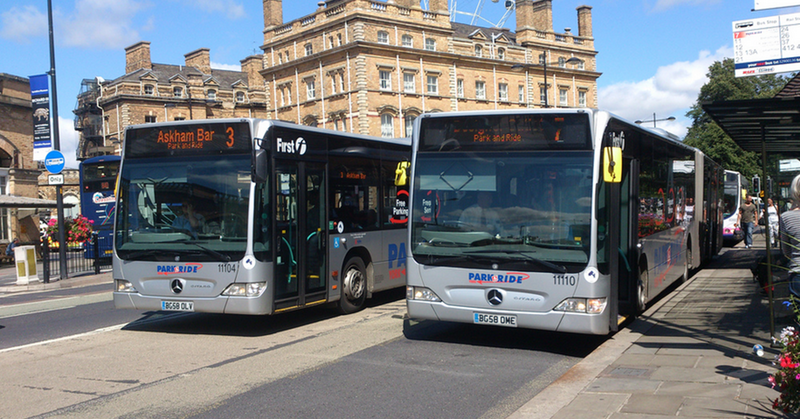 Whether it be through the “better bus area” funding or a strong provision of, and investment in park and ride facilities, the residents and visitors to York benefit from the collaboration between local authority and local operator. It is a recipe for success and one that results in benefits for all involved. Here’s hoping that other local authorities look at the work of Transport for London and York City Council and act to promote bus travel within their regions. The two photos of York's buses are courtesy of Chris, keep an eye on his photostream for photos of the new electric bus in service over the coming weeks. A year ago today, Premiere travel ceased trading. They had ran out of money and without any buyer coming forward, the company had no choice but to close. It drew a close to ten years of the ‘marmite’ company that was famed for its “fare fairs” and competition along corridors served by Trent Barton. Premiere’s collapse wasn’t exactly a shock, but at the same time it was a little unexpected and happened very quickly. There were mutterings of it happening on the Sunday and by the Friday the yard gates were locked. It goes to show that it is practically impossible to know the exact financial position of a company, or indeed how well they are performing. Since Premiere’s demise, we have seen two other firms in the East Midlands succumb to economic problems. Both K&H Doyle and Gills were smaller than Premiere but all three relied heavily on work part funded by local authorities. All three are testament to the fact that this work will not guarantee long term survival, in a time of massive cuts to public funding, these contracts cannot prop up risky commercial ventures, as within time, cracks will start to show. 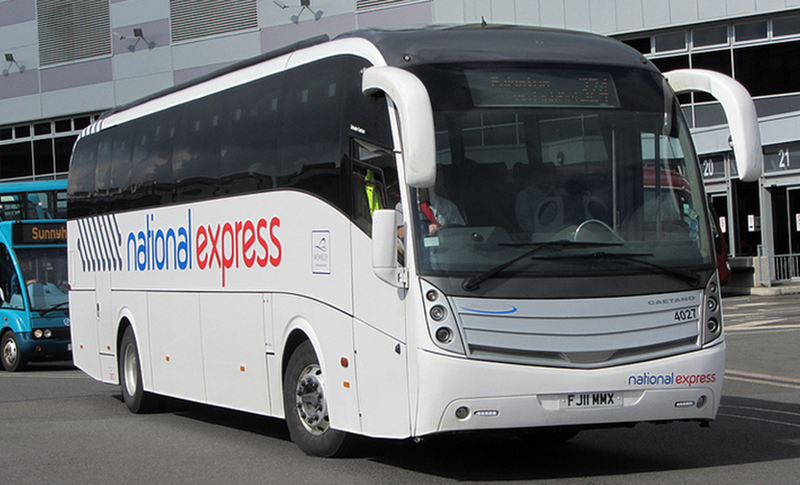 Premiere also operated services on behalf of the University of Nottingham and National Express which shows that the margins on this work will be tiny and not enough to keep a business going indefinitely. 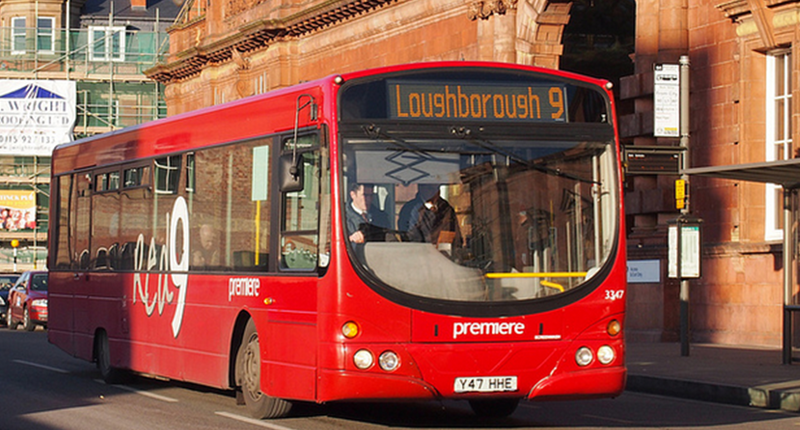 Premiere tried a large number of routes linking Nottingham with various Trent Barton strongholds with varying degrees of success. The Red1 to Bingham was popular due to it providing a direct link to Radcliffe from Nottingham, rather than going via West Bridgeford. Trent Barton struggled for capacity at Premiere’s collapse and the same was true for Skylink, with the Red5 being reasonably popular. 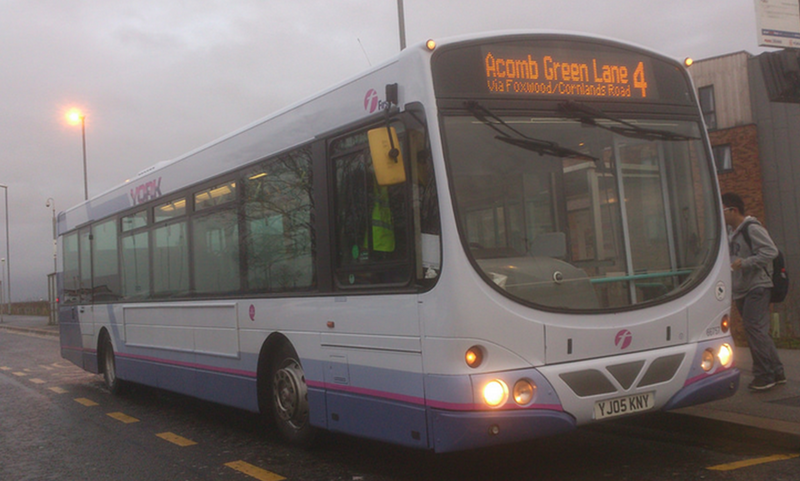 Less success was found in Stapleford and Cotgrave, not helped by Midland General’s bargain bus. 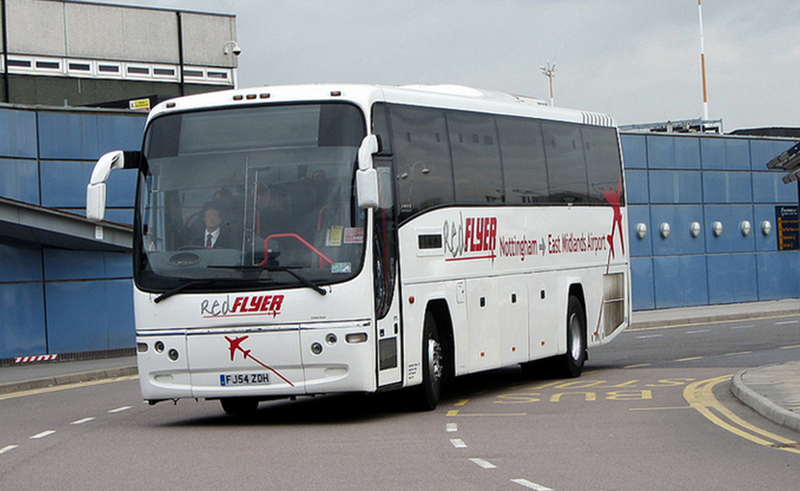 Similarly ill-fated was the Red Flyer which was withdrawn after reportedly making losses of £1,000 a week. This on a route that required only two buses. It was before Premiere’s collapse that we learned of Yourbus’ plans to run their Citylink service. Often branded as the “posh premiere,” their tactics and methods do seem familiar, building up a portfolio of contract work and attempting a number of commercial routes in competition with established operators. There are, however two key differences which could place Yourbus at even more of a disadvantage. 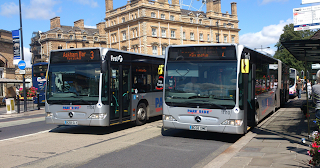 Firstly is the large amount of dead mileage that Yourbus’ fleet travels on a daily basis. 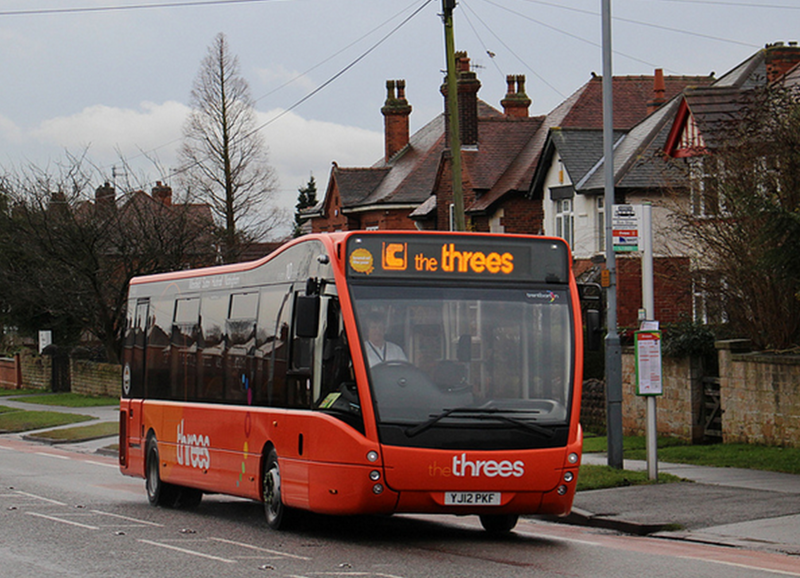 With the exception of the Y1 Y3 and 138, all Yourbus routes start in towns some distance from their Heanor base. 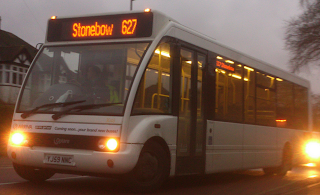 At least one bus even travels empty from Ashbourne to Heanor every evening, a 40 minute, 20 mile trip. 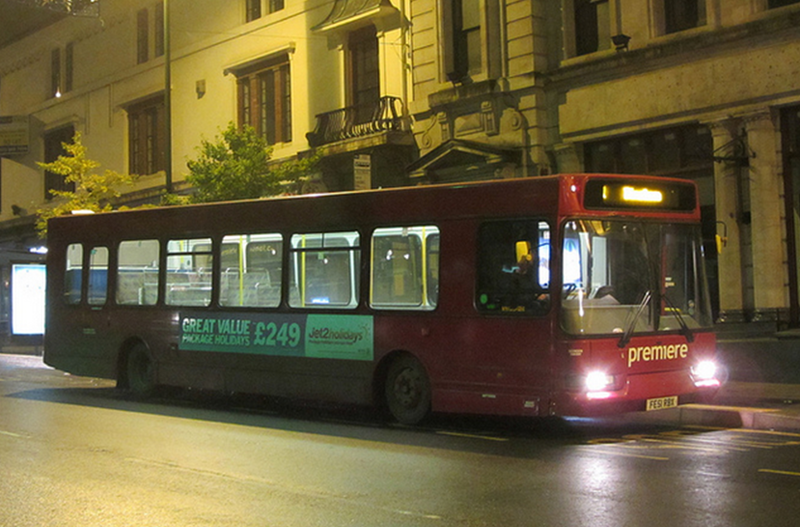 In contrast, most of Premiere’s routes started or finished in Nottingham, a mile or two from their depot or were interworked with routes that did, the 228 was ran off the back of the Red8, for example. This adds a massive sum to Yourbus’ fuel bill but also the wages bill. It is a little difficult to comprehend how this can be sustainable, particularly when many of the contracted journeys were won off established operators who would have had a good understanding of the pricing for the tenders. Even more so when you consider that a reasonable amount were taken off K&H Doyle who have themselves been forced to shut. Premiere certainly didn't have the most attractive fleet! Secondly, Premiere’s fleet may have looked terrible, it was certainly economical. It was a mishmash of buses many of which could have done with a bit of TLC, but buses were no doubt bought at good value prices. In contrast, runs a very modern fleet, with bought-from-new Mercedes Benz Citaros for the commercial services and Wright Streetlites making up the backbone of the contracted fleet. These will no doubt come at a cost before considering depreciation. What however works in Yourbus’ favour is that nice new buses will attract more customers which will make the work more profitable. Yourbus certainly aren’t the only operator in the county to buy brand new buses for tendered work either, Hulleys of Baslow regularly add new members to its fleet so it clearly isn’t that alien an idea. 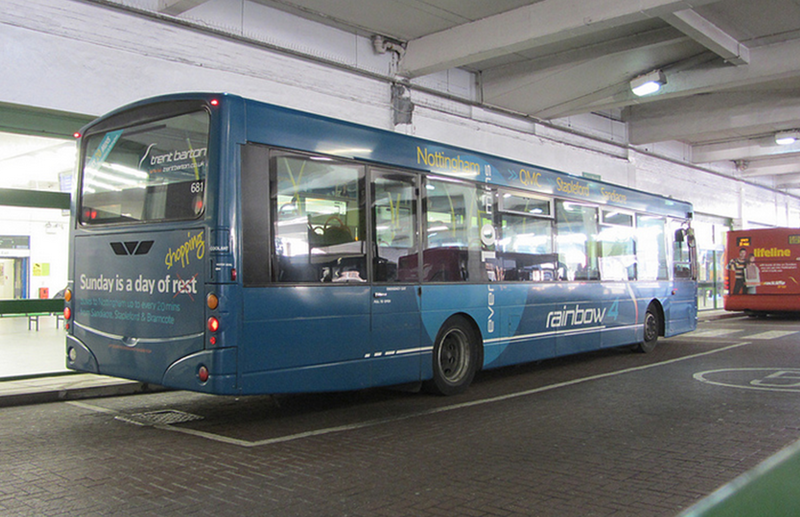 Y1 is one of a number of routes ran with brand new Citaros, a far cry from the second hand buses Premiere used to compete. I’m not of course suggesting that Yourbus will be in administration within days. A quick look on Company Check shows that they retained a profit of nearly £1.2 million in the financial year ended last February. However, I do hope that Yourbus don’t live up to their nickname as a “posh Premiere,” given that people’s livelihoods are always on the line in these type of situations. Hopefully, Yourbus can continue to place the necessary checks and balances on the established operators in a sustainable way, or at least realise any mistakes they are making before it is too late and they too suffer the same fate the Premiere suffered a year ago today. It’s been nearly a year now since Premiere travel ceased trading, and only a few months since Gill’s travel shut its doors. 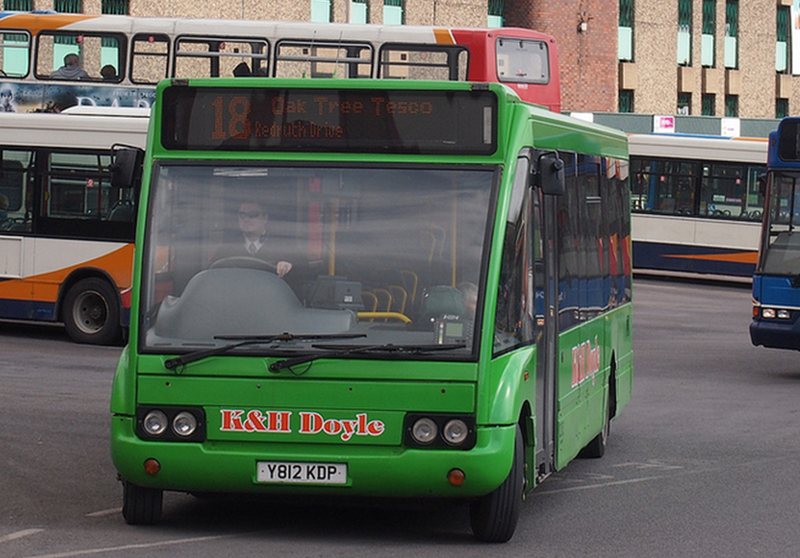 Now, we hear the sad news that K&H Doyle’s Coaches of Alfreton have gone out of business. 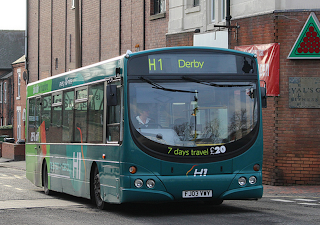 Their fleet of smart lime green buses have been a feature around the East Midlands, particularly Alfreton and Mansfield for many years, and their loss is a sad one, and indeed a reflection on the hard times that many companies continue to face. K&H Doyle was started by husband and wife team Kevin and Helen Doyle back in 1986. They were a company that relied upon council contracts, and as far as I am aware, all of their routes at closure relied on council subsidy. A quick glance on their (still active) website history shows that they have, at some point, reached all corners of the region, from Sheffield to Ashbourne, from Derby to Nottingham. The council tender market in recent times has however become far more competitive. 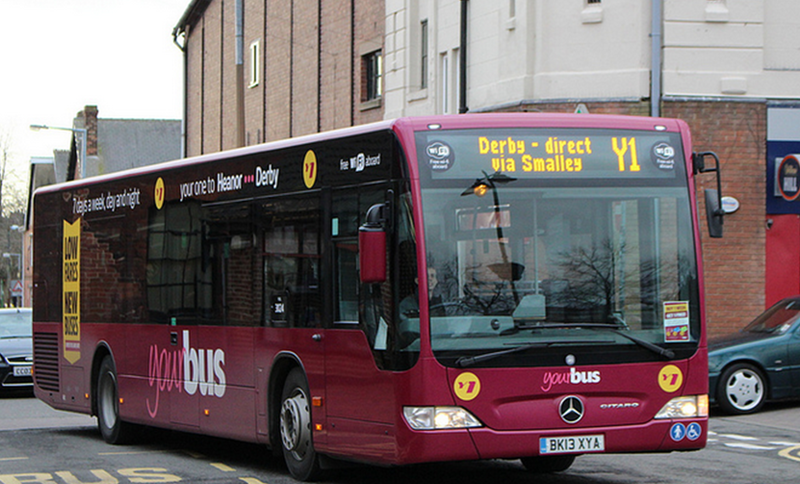 Yourbus is now a big player in the market and I fear their arrival may well have been the cause of Doyle’s closure. 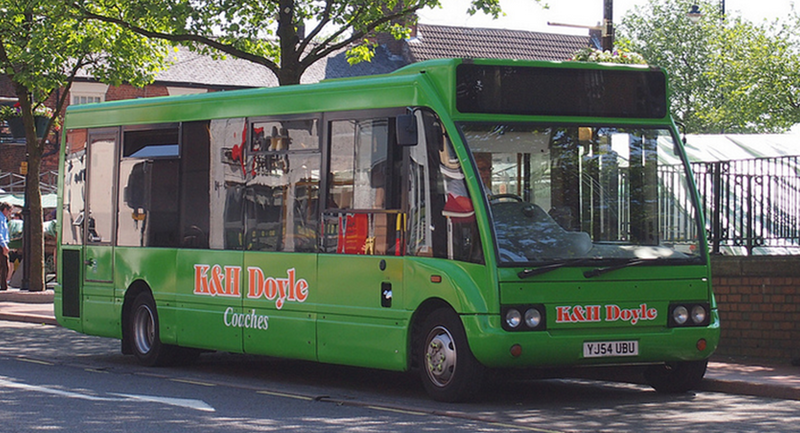 In October 2009, K&H Doyle lost their first contracts to Yourbus in the form of the 140/1/2 services around the Crich area. Since then, Yourbus have taken over the running of the 228, 229, 59, 138, 101 and 147 all from the same operator. 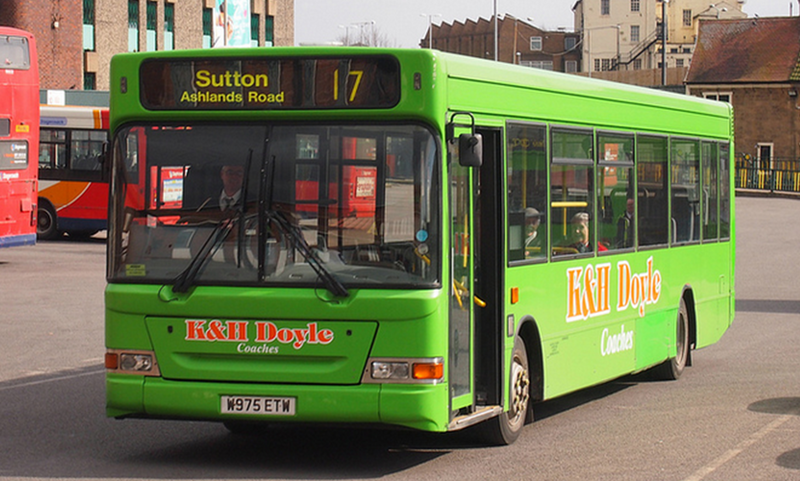 The 101 was registered commercially by Yourbus, K&H Doyle decided to attempt a competitive commercial service too after the council was obliged to withdraw their subsidy but it was Yourbus who were successful in that battle. The failure of K&H Doyle also demonstrates that the belief that council contracts are “guaranteed money” and are able to support failing commercial services is misguided. The notion that a company’s financial future is sound because they have a large portfolio of subsidised routes is wrong. K&H Doyle were a company who had such a portfolio, and with no commercial services to drain cash either. In the competitive market, companies are having to bid for contracts with little or no profit margin, and if the collective margins don’t cover any overheads, then it won’t be long until the bailiffs come knocking at the door. It is cruel coincidence that one of Doyles’ routes at their closure was the 228, one taken on after the collapse of Premiere last year. 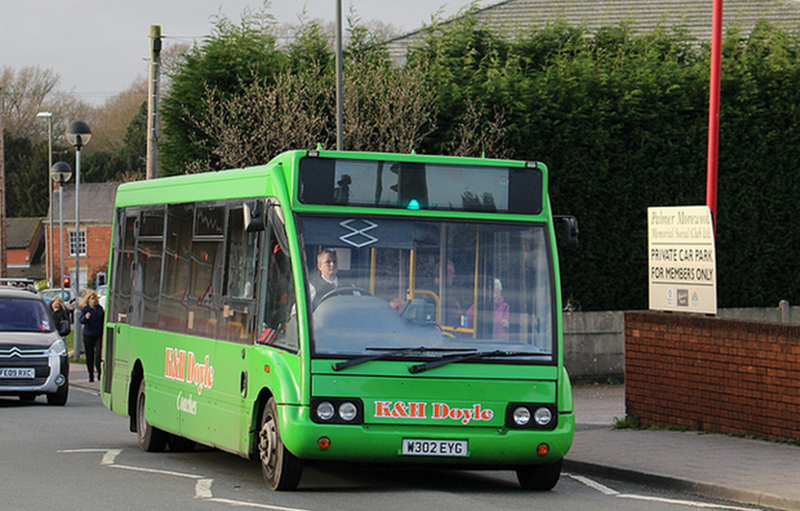 Or that Gill’s Travel operated two of Doyles’ former buses, still in their green livery. The loss of K&H Doyle is a sad one for the region; they were a liked and respected operator, judging by the messages of condolence on twitter from big names in other companies. The majority of services seem to have been replaced within a short space of time, and hopefully former employees will find work at other companies quickly. It is a great shame, but we shall never see the smart green fleet on our roads again. Heanor has, over the past six months or so become a key battleground town in the competition between Trent Barton and Yourbus. It’s hardly surprising, seeing as the town is home to the head office of both companies. And whilst all competitive routes are being well fought out, the H1/Y1 competition has resulted in a lot of changes, at the expense of the accounts of both companies, but undoubtedly to the benefit of passengers along the corridor. 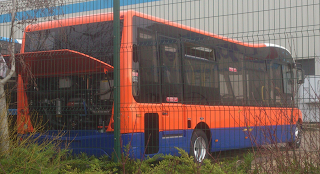 In December 2008, the four 2001 Optare Solos were taken off H1. 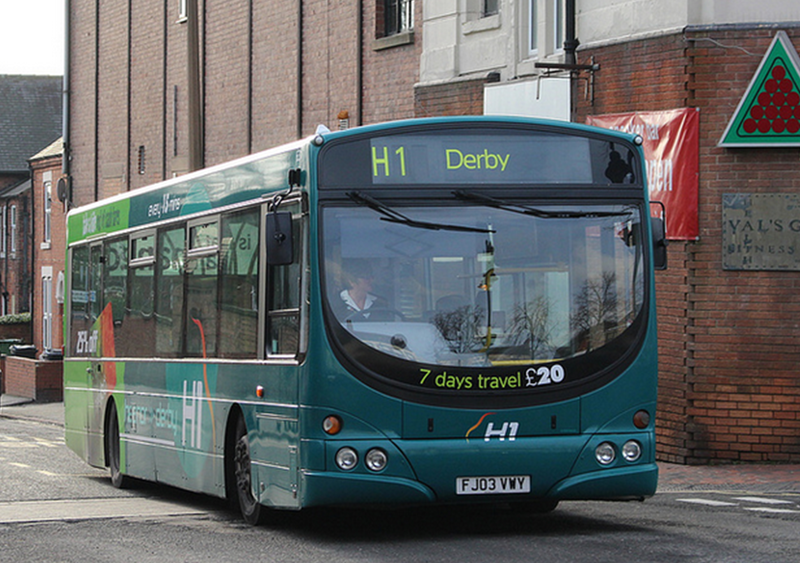 Wearing their third variation of the livery for the direct Derby to Heanor service, they were no longer big enough for the amount of people using the service. 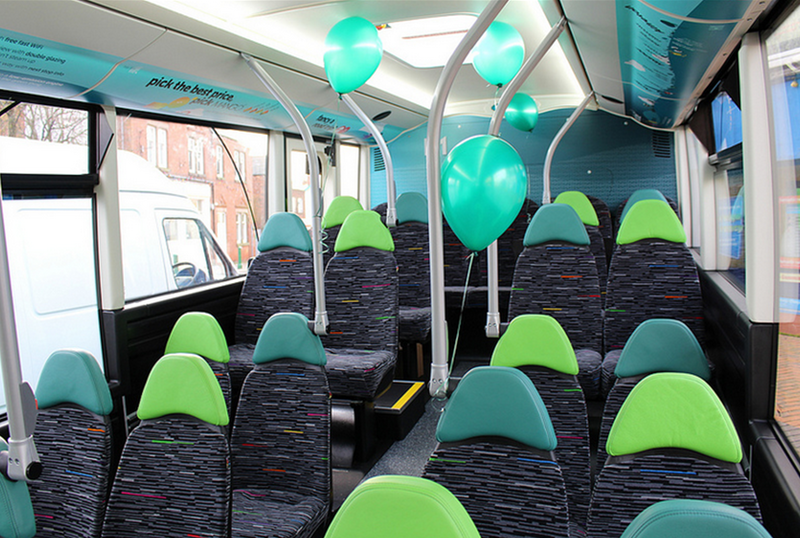 The Scania Wrightbus Solars proudly proclaimed that the new additions to the H1 fleet boasted 30% more seats, to make sure everyone could have a comfortable journey. "The H1 team are fantastic, they’re the number one reason when we ask our customers why they choose to travel on H1 compared to our competitors” Alex Hornby. The nostalgist in me particularly likes this rear ad, given the route's former nickname of "the happy 1"
However, at the start of August last year, the H1 gained some company, at least along the more frequent and popular Heanor to Derby stretch. As part of their network expansion, Yourbus introduced a brand new fleet of Mercedes Citaros on their new Y1 route, complete with free Wi-Fi and a matched 20 minute frequency. This was serious competition for the route, and I (with my limited knowledge on figures) wondered just how H1 would fare; would the low fares and new buses win over vast sums of customers? Or would people stick with what they knew? In order to keep control of this busy corridor, Trent Barton had to offer something different and more attractive, and they’ve made every effort to do just that. Firstly, an extra bus was drafted in to create a better frequency. That means more flexibility and less waiting for customers which is very likely to appeal. 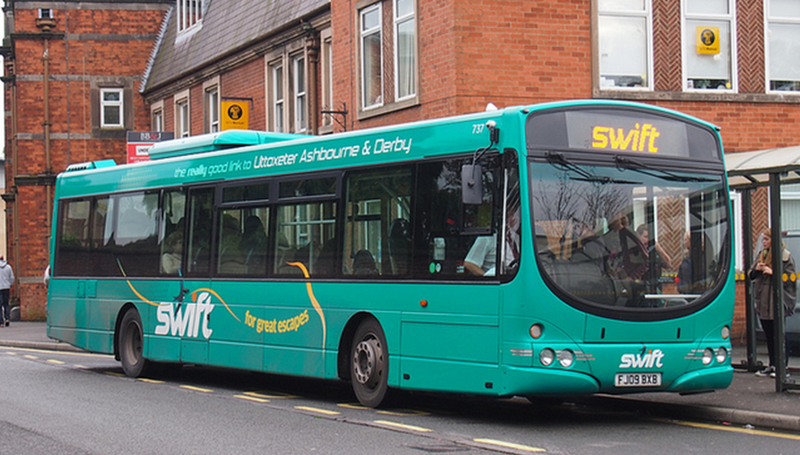 Then came fare deals, such as half price travel after 7pm and on Sundays and £1 trips for students travelling between Derby and Broomfield College. These would have appealed to vital sections of the customer base and may well have encouraged those who would usually use alternative transport to try the bus, thus growing the market in general. 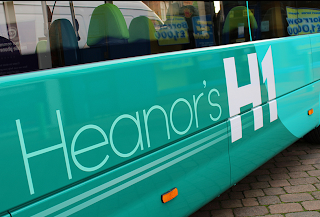 ...but we'll also take you back to Heanor via the quick route"
But none of that is as significant as the £600,000 investment made into brand new, state of the art buses for the route. They went into service yesterday, having been on show in both Heanor and Derby over the course of the weekend. 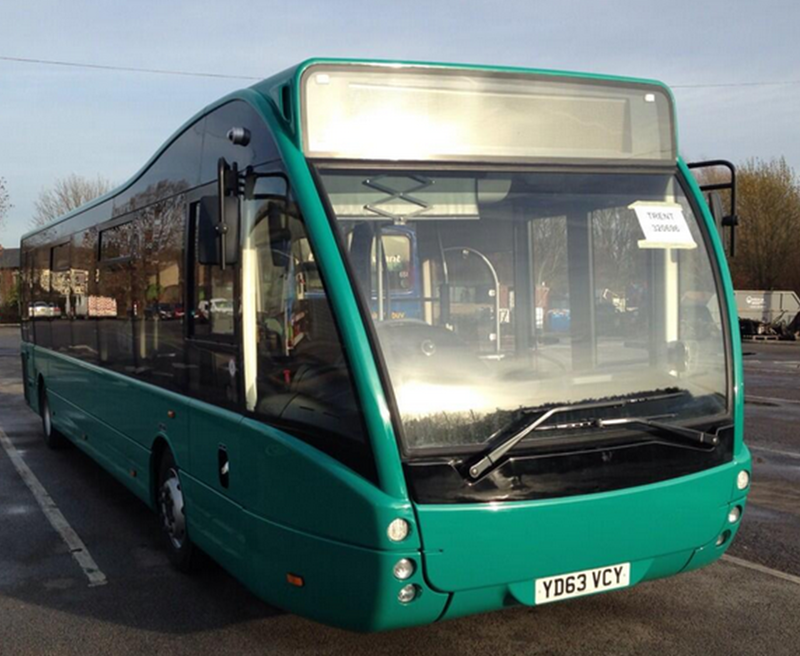 Whilst I admit I have had to watch from afar (mainly via flickr), the new buses do look fantastic. Clearly a lot of effort has gone into the passenger experience, and the five Optare Versas look very modern and stylish, thanks to the new(ish) Trent Barton brand. Customers will now also benefit from high speed Wi-Fi, "the fastest Wi-fi we can get," according to Alex Hornby. They’ll also never miss their stop, thanks to next-stop displays inside the buses, nor will they miss their bus coming thanks to a Trent Barton first; full colour LED destination displays. 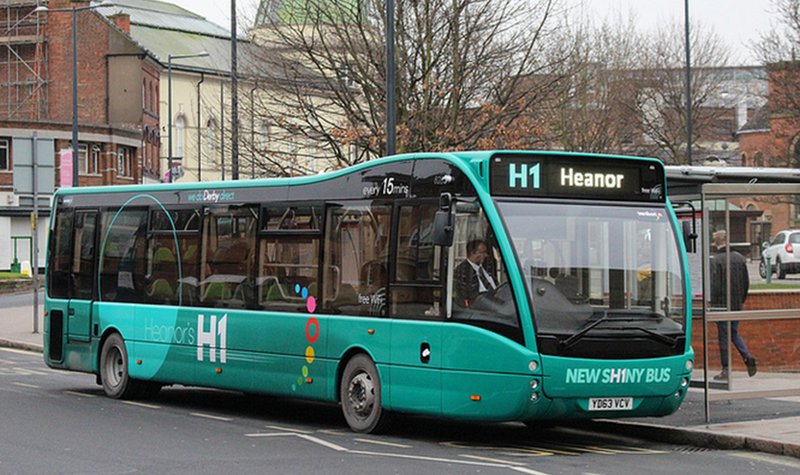 The introduction of the new buses will no doubt put the H1 back into a very strong position in the Heanor to Derby battle. They've given the route vast sums of publicity and provide a passenger experience unparalleled in the industry. 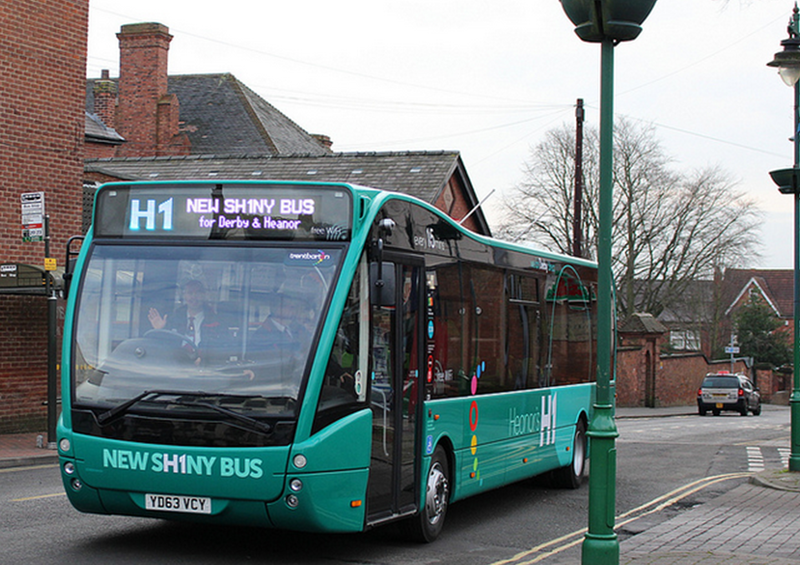 Despite a recent increase in the frequency of the Y1, the introduction of the new buses to the H1 will no doubt keep the route as a firm favourite for the locals of Heanor. All the photos are from Matt Burley. To see Matt's fantastic video about the launch, take a look on the Trent Barton play Youtube feed here. Hot on the heels of last year’s ‘Happy Hour’ on Red Arrow, Sundays in January see an hour of free travel across the Trent Barton network. It’s a scheme called “Free Ride Sunday” and it’s designed to get more people on the buses and into the city centre on what has traditionally been a day where people have stayed at home. People’s general attitudes towards Sunday being a “day of rest” have massively changed. The number of people who would consider themselves Christians decreased by 4 million between 2001 and 2011 according to census figures, whilst the proportion of people who considered themselves to have no religion increased by 10% to a quarter of the population. From my own personal experience of working in retail, it is not uncommon for us as a shop to take just as much, if not more on a Sunday than the Saturday before, despite 3 hours fewer trading. Sunday is therefore, it seems, becoming the new Saturday. But there are a few factors holding it back. Sunday trading hours, for one thing. Large shops (over 280 square feet) are restricted to just 6 consecutive hours of trading which discourages smaller shops from opening for much more; it is the larger shops that draw the customers into the retail destinations. Secondly, public transport links are nowhere near as good on a Sunday as any other day of the week. Very few bus or train routes run to the same timetable on a Sunday, with some routes seeing no service at all. 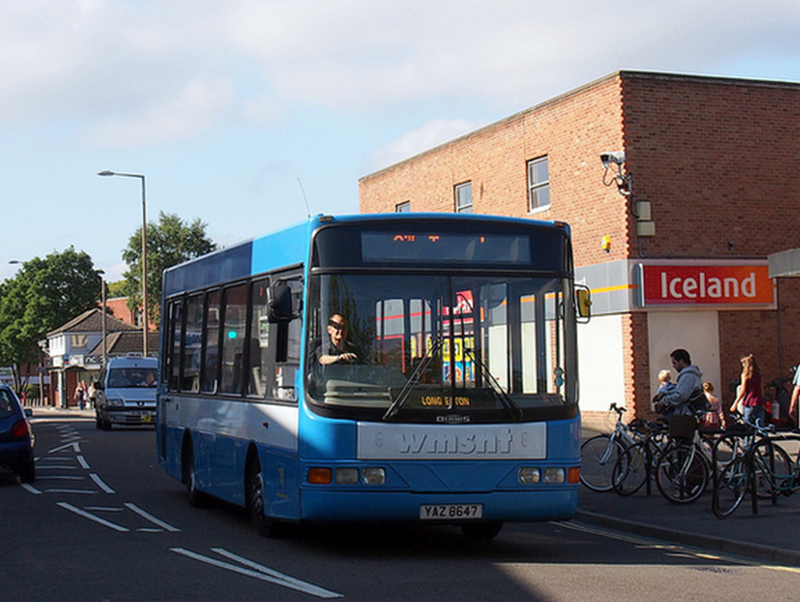 Many that do run rely on a council subsidy or use truncated routes in order to be sustainable. There is, of course, another incentive for the operator. It will get more people to try the bus as a means of transport. Many people still stereotype buses as being like something out of the sitcom “On the Buses,” dirty, dingy and not nice things to be on. Whilst certain operator’s vehicles may way still live up to that stereotype, the vast majority of Trent’s don’t. Customers may well be pleasantly surprised on how advanced buses have become, particularly considering recent additions such as air conditioning and Wi-Fi. On this, Alex comments “In 2014 we want to see more people discover the comfort, convenience and value for money that our friendly, frequent buses provide while helping to cut congestion on our busy roads.” All it takes is a few individuals to swap to bus travel from the car for the scheme to break even, which if nothing else will be a nice treat for regular customers, which may encourage loyalty at a time of heavy competition. So what is a relatively simple idea is fantastic on many levels. It is well supported by groups representing the retailers in Derby and Nottingham due to its potential to increase patronage on Trent’s buses as well. Furthermore, the more people that convert to bus travel results in fewer cars on the road, which is good for the environment too. Here’s hoping that it proves successful. Why is P&R so popular in York? As I’ve mentioned on a few occasions on this blog, York boasts one of the most successful Park and Ride scheme of any city within the UK. In recent publicity for the new Poppleton Bar site, the City Council brags that whilst most Park and Ride schemes require a Council subsidy, it actually receives a licence fee from First York in order to operate the services. So why is the York scheme so popular? Why is it something that is profitable in this reasonably small city, whilst in most cities the schemes fail to even break even? York currently has five Park and Ride sites dotted around the outskirts of the city. Askham Bar and McArthur Glen are at the South of the city, Monks Cross and Rawcliffe Bar are at the North whilst Grimston Bar is at the East. All are situated on, or close to main ‘A’ roads, and when the Poppleton Bar site opens in the next few months, every major road into the city will have a P&R site on, or near to its intersection with the outer ring road. This comprehensive coverage certainly makes it appealing to car drivers, in that they will inevitably have to drive past a site if they intend on heading into the City Centre. Compare this to Derby, where car drivers have to go a significant way into the city to get to a site, which is a relatively long way from the route they were taking. Finding the site is enough hassle before contemplating having to get the bus for the remainder of the journey. The multiple, well placed sites are a crucial part of the scheme’s success. Another crucial factor is the horrendous congestion that occurs in York at the drop of a hat. The fact that a large proportion of the historic city walls remain to this day shows that whatever era York was designed for, it certainly wasn’t the current one. With regular queues in the city centre, combined with extortionate parking charges (York City Council raised £5 million through parking last year) makes the city centre an undesirable place to be if you’re a car driver. A family of four, with two adults and two under 16s can travel into York for just £5.40 after the fares go up tomorrow, which is a considerable saving on parking for large periods of time, not to mention any money saved on petrol. Once on-board, traffic becomes far less of an issue, with all routes into the city centre featuring bus priority systems. The new Poppleton Bar scheme includes nearly £4.5 million worth of investment into making sure the P&R buses have an easy route into town. Three out of the current five routes benefit from the city centre’s bus only roads, with the Rawcliffe Bar route recently benefiting from the conversion of the famous Lendal Bridge into a bus only road during the day. What this can often mean is that parking at a P&R site, waiting for a bus and then going into the city centre can be quicker than driving in yourself. That’s before the time and patience that has to go into finding a parking space. For many people, using the Park and Ride is a logical choice. Finally, having a smart, dedicated fleet of buses makes a massive difference. It’s not a description that you would usually attribute to a First bus, but thee fleet is well turned out in a tasteful silver livery. There’s a generous contingency within the P&R fleet too, which makes a standard liveried bus a rarity. The new Versa EVs due would suggest that a variation of the First corporate livery could be coming to the P&R fleet, but it will no doubt retain the prestige the current one offers. Going back to my ‘bad’ example of Derby, this isn’t the case on the Northern D1 P&R. Today’s offering was two Optare Excels, one in Unibus livery and one in College bus livery. The branded bus was withdrawn quite some time ago. Many P&R users may be tourists, or people unfamiliar with the area and a dedicated, easily recognisable bus is a must. This is something that York does well, which will no doubt be a contributing factor towards its success. So it is without a doubt that York’s P&R scheme is one that should be looked at for best practice. It carries some 4 million passengers every single year; an astonishing figure. And it certainly isn’t a novelty. Demand has outgrown supply; extra capacity is clearly needed by the new Poppleton Bar site. Furthermore, the Askham Bar route is to move to a new, larger car park to keep up with demand, given that the site often fills up by mid-morning. Four million passengers is somewhere near 1 million cars of the city centre’s streets, creating a more pleasant, safer and greener environment for people to enjoy. It is a scheme that could and should be replicated in many major cities, and is solid proof that bus travel is not a thing of the past; it can play a crucial part in developing a more sustainable future. All the photos on this post are once again courtesy of Chris Nelson on flickr. First things first, Happy New Year to all readers! Apologies for the lack of updates recently, it’s been a busy time for me lately, and sadly the blog has had to take a back seat. Hopefully, with lots of upcoming developments in both York and the East Midlands, reasonably regular postings should now resume! The early stages of 2014 will see investment by four major companies across this blog’s catchment area. Up in York, the city’s two major operators, First and Transdev are both set to receive vehicles partially funded by the green bus fund. As I’ve mentioned before on here, York City Council are very ‘bus friendly’ and the city’s comprehensive Park and Ride scheme is testament to that. 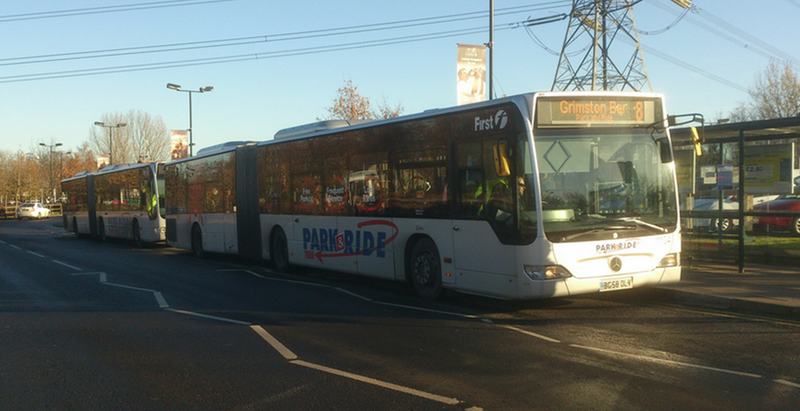 York currently has no less than five P&R sites dotted around the city’s outskirts, and I’ve often seen the Mercedes Benz articulated buses leaving with a full standing load, despite a ten minute frequency. On quieter days, and on the Monks Cross service, where bendi-bus operation is not possible, smaller Wrightbus Eclipses shuttle people to and from the city. With rumours that these are currently off for a mid-life refresh, the new, all electric buses for the city’s sixth site are nearly ready for delivery. The new site will be situated at Poppleton Bar, where the main road from Harrogate meets York’s outer Ring Road. 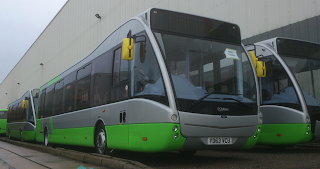 The new Optare Versas, in a new variation of the First Group livery, will hopefully take thousands of cars off York’s congested roads and will reduce the city’s carbon footprint, with no CO2 emissions from the buses themselves. 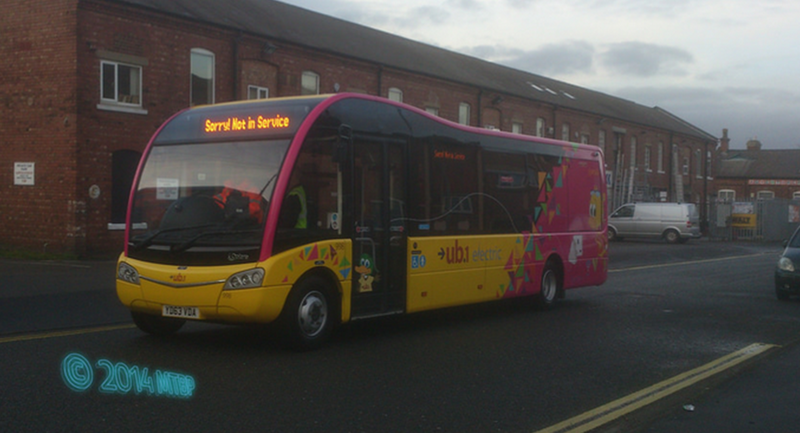 Meanwhile, Transdev are awaiting the arrival of a new Optare Solo EV, to be used on the Unibus UB1 service, which links various parts of the campus, free of charge. An MPD, branded for the service, has been promoting the Solo’s arrival since September, leading to much discussion and excitement amongst students. Another recent, but by no means new arrival is a ‘Y’ plate Wrightbus Renown. 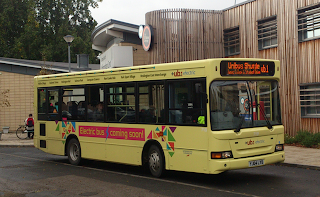 Acquired following complaints by the University that the 44 was seeing buses with far too many colour schemes, the bus is in the unibus base colours, but with no vinyl’s, just a Transdev logo, allowing it to easily slot onto other routes. It is said to be the first of several Renowns arriving at York, with several due for the Coastliner 844 service. 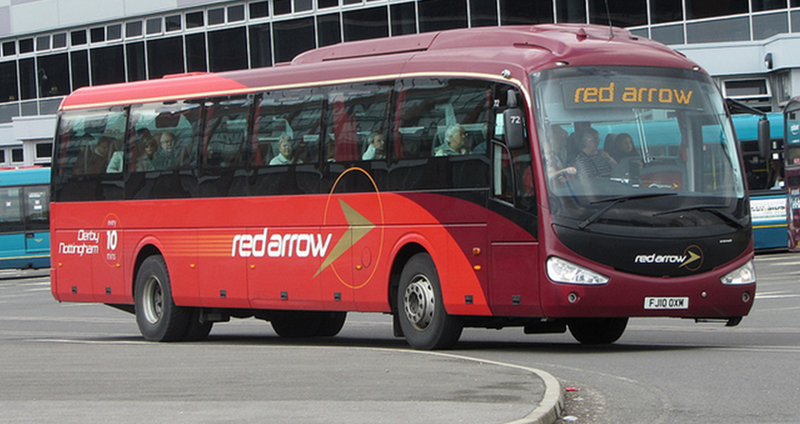 With Wrightbus Eclipses and Geminis about to go off lease, the Renowns will replace them, which is a significant downgrade for what is supposed to be a high quality long distance brand. The Renowns currently used on the service are not nice to travel on, even for the much shorter journeys on the 44 and 20 that I’ve sampled them on. Hopefully this will be purely a short term measure. 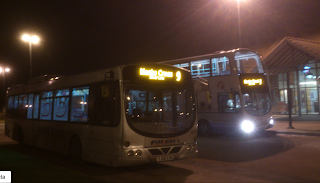 Back in the East Midlands, both Trent Barton and NCT have had new buses delivered over the Christmas period. NCT received five ADL Enviro 400s, which appear to be joining their spare fleet over the coming weeks. They are the first of 40 that are due, featuring Scania engines, which can also be found inside NCT’s large Omnidekka fleet. 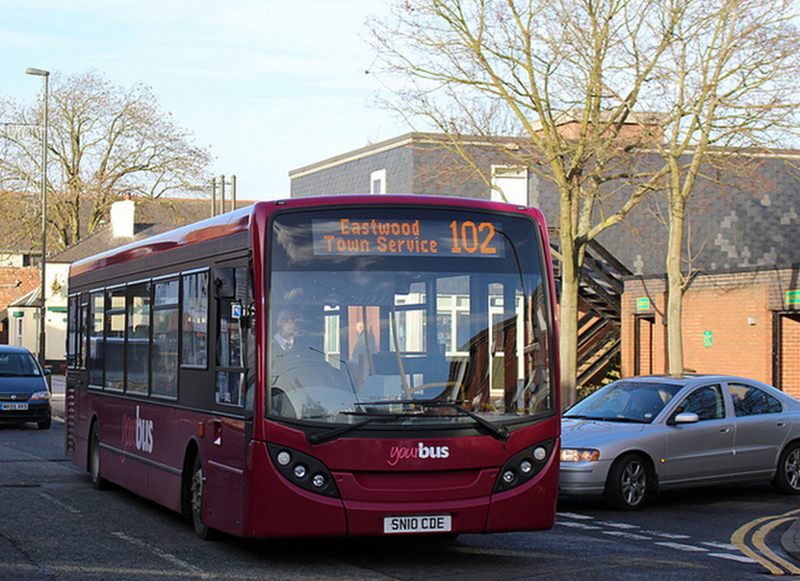 They follow on from the Enviro 200s, delivered last year that can now be found on blue, brown and purple line services. 2014 should see Trent Barton restarting the Sixes refurbishment programme. With only two Solars left to be done, we should see the full livery applied to all ten buses within the next month or two. Meanwhile, the Sawley network is set to drastically change yet again in January, with the short-lived Sawley Xprss set to finish. Instead, Zoom will reduce to half-hourly, with alternate buses extending to either Old or New Sawley, seemingly requiring one less bus. Meanwhile, Skylink Nottingham is to benefit from a frequency increase, to three buses an hour as far as East Midlands Airport. 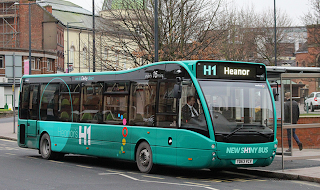 The two extra buses required are set to come from the H1, a route that will see a fleet of five Optare Versas introduced on the 12th January. 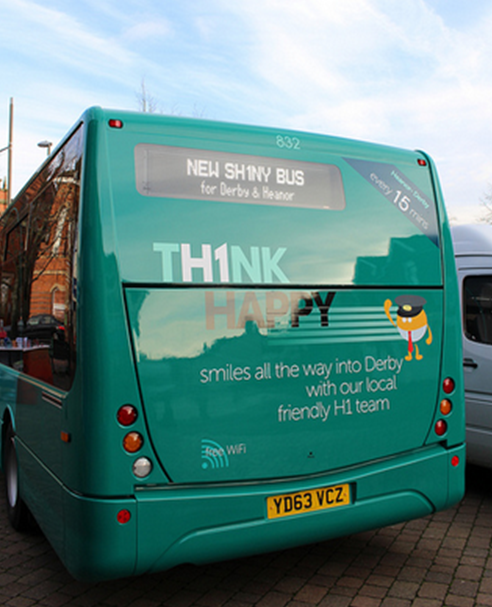 On a route that faces direct competition, Trent Barton hope that the brand new buses, fitted with double glazing and high speed Wi-Fi will give them the edge. 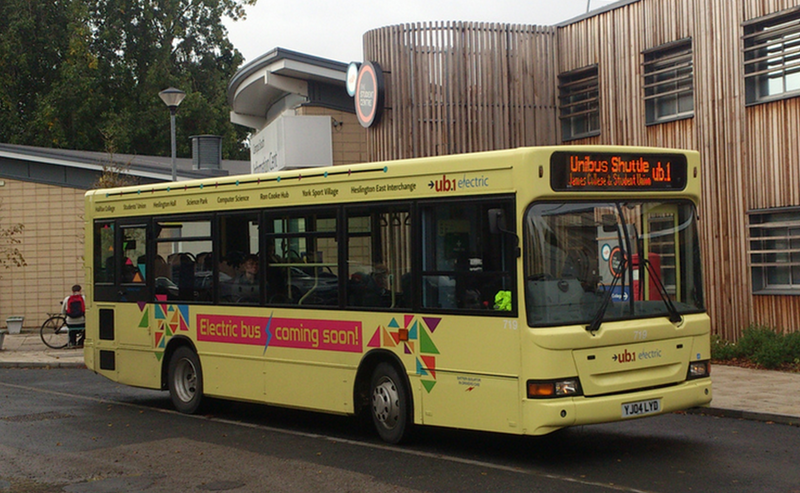 It comes as Yourbus is to increase the frequency of the Y1 to every 15 minutes to match that of the H1. 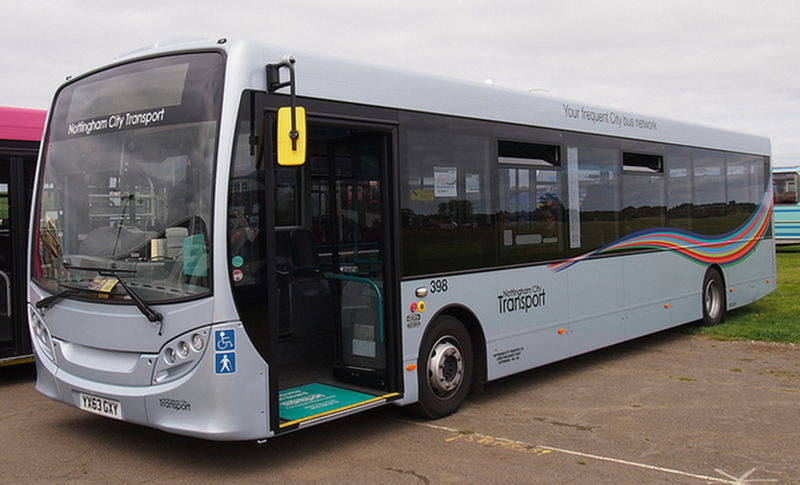 They are the first of £5 million worth of new buses due in 2014, though at this stage we do not know what buses have been ordered or what routes will benefit. 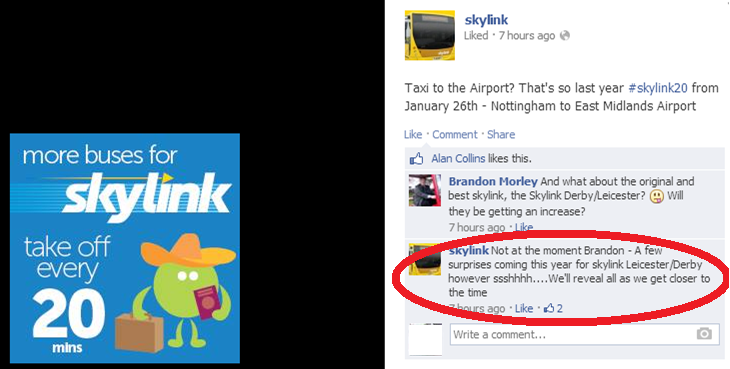 A rather large hint was dropped, however, that Skylink Derby-Leicester is to get new buses at some point this year. TM Travel is due new Optare Versas for its Line 30 route in Sheffield, so it looks like an exciting year for all of Wellglade’s subsidiaries! 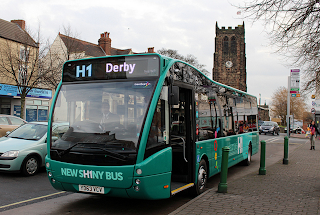 A slight hint that new buses could be Derby Skylink bound! Not wanting to be left out, half Wellglade-owned High Peak is due some brand new Optare Solo SRs too. 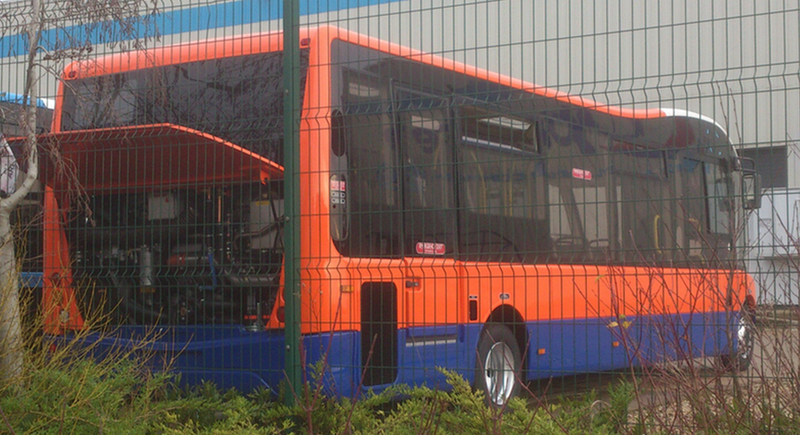 With a Solo having escaped the Optare factory in Centrebus colours, could these be coming sooner rather than later? All in all it looks like an exciting 2014. There’ll no doubt be controversy, competition and celebration, as the various companies strive to make their services as popular as possible. 2013 certainly wasn't a quiet year, with two bus companies in the Nottingham area going bankrupt, a partnership between two rival companies and a stack of new buses and routes. However the early signs do seem to suggest that 2014 will be just as, if not more eventful than 2013.